Mid-Century Furniture | Page 59 | Interior Boutiques – Antiques for sale and mid century modern furniture, french furniture, antique lighting, retro furniture and danish furniture. 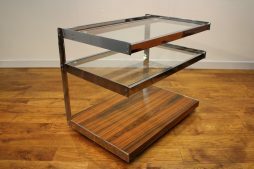 Merrow Associates chrome and rosewood drink trolley. Dating from the 1970’s, and designed by Richard Young. 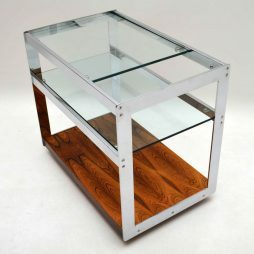 Merrow Assosciates were a British firm producing quality pieces from the late 60’s to mid 70’s. Their pieces were often retalied through Heals of London and other prestigious retail shops. There are a few variants of the Merrow trolley and this version is quite scarce. 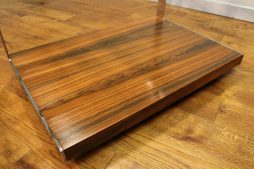 The chrome and glass are both in good condition and our in-house restorer has applied a polish to the rosewood veneer. 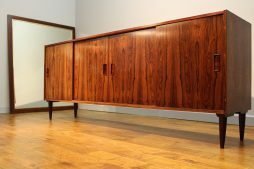 Re-worked Danish late 1960s Westergaard rosewood sideboard. A smart piece which was nicely made but not suited to today’s market. It originally with a plinth base which we’ve removed and replaced by new dark turned wood legs. Also it had a top section which when removed left the top surface only partly veneered in rosewood. We’ve had a new black laminate section put in to the top which has been fitted by a local specialist company. 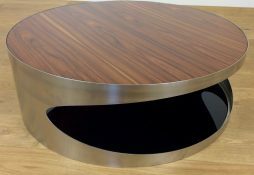 Not only does the black laminate look very smart with the nicely figured rosewood, but it means that you have a heat proof surface upon which drinks can be served or hot mugs placed without worrying about leaving heat or water marks. It would also be ideal for standing a large flat screen TV in a living room. Labelled for the quality Danish maker Westergaard who specialised in chests of drawers in the 1960s, the top section was dated on the rear 1969. The quality of the interior fitted drawers is a sign of how well made this piece is. Detailing like this wasn’t cheap in the 1960s, but would cost an absolute fortune today. The rosewood veneers are a good original colour with nice figuring. All in all a stylish and practical good value piece of furniture. 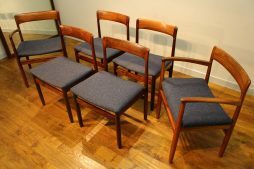 Set of 6 A Younger rosewood dining chairs John Herbert early 1960s . This lovely design is often thought to be Danish as it looks similar to the Moller 75 which must have inspired it . 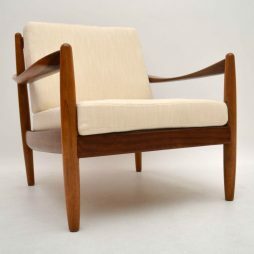 We’ve had it a number of times before in teak , and seen it occasionally in rosewood with other sellers of Mid-Century furniture . As always most people didn’t buy the carver chairs back in the early 1960s , possibly because they would have been around 40% more expensive at the time . Today vintage carver chairs of this quality sell for around double the price of the standard chair without arms ! 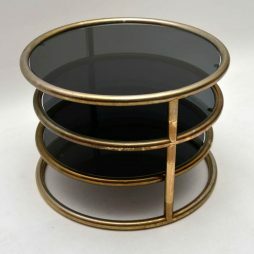 John Herbert was a talented designer who often came up with stylish mid-century designs . 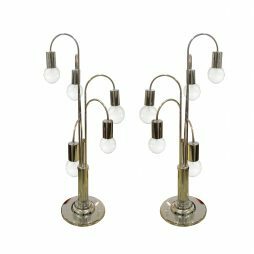 A Younger were one of the top names in contemporary British furniture at the time , and their quality was well known . 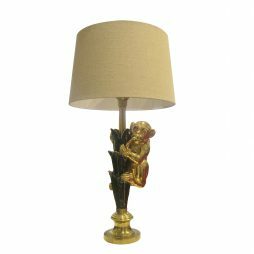 Their pieces were always top quality in the late 1950s until c 1968 when they had to move down market as UK taxes for their typical customers went up considerably and the top end of the furniture market would have been badly hit . 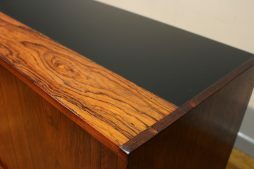 Much heavier than the same model in teak , these rosewood ones have a lovely colour now that we’ve had them re-polished . 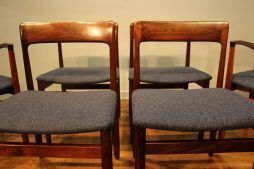 They must have been in a very sunny room for a number of years as they were so badly faded that they looked more like teak when we bought them . 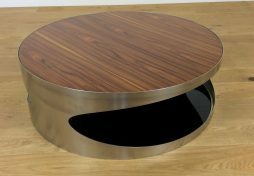 Mid Century Rosewood and Aluminium centre Table with black Glass Base. 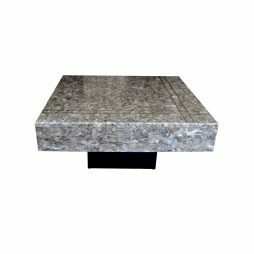 Great design to this Mid Century Modern Centre Table. 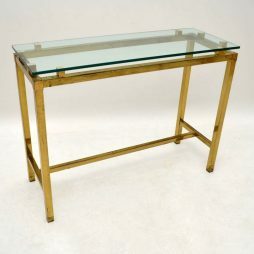 A stunning vintage console table in brass with a clear glass top, this dates from the 1970's. The condition is very good for its age, there is just some minor patina and a few marks here and there on the frame. The glass top is very thick with no chips or cracks, just a few very faint marks on the top. 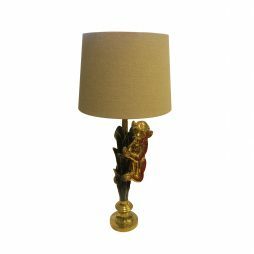 A rare ceramic Italian table lamp of a monkey eating a banana, 1970’s with brass base and stem. Antique gold braided electrical wire, E27 ES large screw light bulb 40W. Excellent condition with signs of wear and tear in line with age. 195o's French three seater bench. 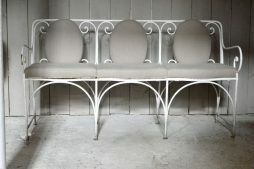 Vintage sofa/bench for garden or home. 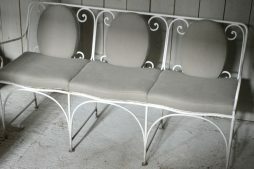 Reupholstered in Grey French linen and original paint to wrought iron frame. 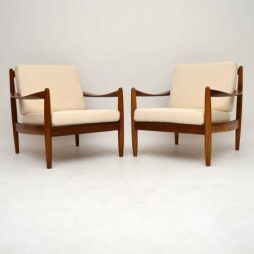 A stunning and very comfortable pair of vintage Danish armchairs, these date from the 1950-60’s. They look like they are solid Walnut, but could be another type of similar wood. We have had the frames tripped and re-polished to a very high standard and the cushions have been newly upholstered in a cream fabric; the condition is superb throughout. We also have the matching four seat sofa, please see listed under our other items for sale. 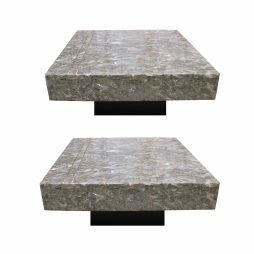 A stunning pair of labradorite coffee table with inlay brass strips. The geological type area for labradorite is Paul’s Island near the town of Nain in Labrador, Canada. It has also been reported in Norway and various other locations worldwide. Labradorite occurs in mafic igneous rocks and is the feldspar variety most common in basalt and gabbro. 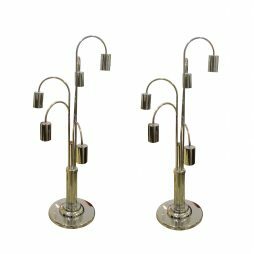 A pair of Waterfall chrome table lamps by Robert Sonneman for Laurel Lamp. Five branches with E27 large screw fittings. 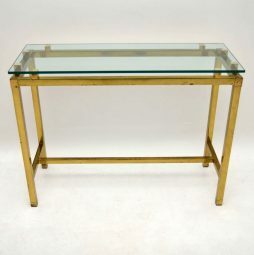 A very stylish and unusual coffee table in brass plated steel, this was made in Italy and dates from around the 1970’s. The frame is a little distressed here and there, but is structurally sound. The two lower tiers swivel out in a useful way, as seen in the images. 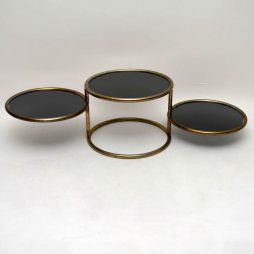 A beautiful and top quality drinks trolley by Merrow Associates, this dates from the 1960-70’s. 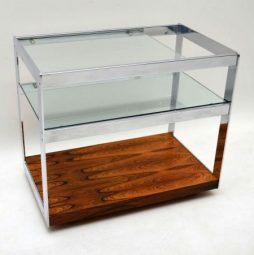 It has a very well made chrome frame, thick glass shelves and a stunning rosewood base. The condition is superb for its age, there are just a few minor marks to the rosewood, seen in the images. Overall this is clean sturdy and sound, it sits on the original casters and rolls smoothly.